The Parish Council approved a resolution of support for Natchitoches Regional Medical Center that will seek up to $9 million for improvements at the hospital. 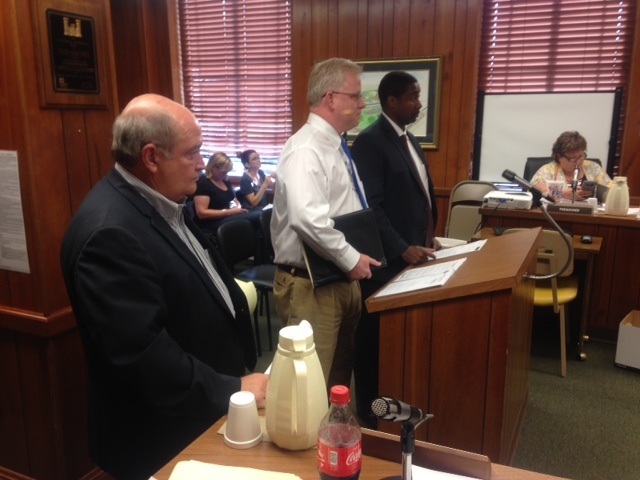 Speaking to the council Monday were, From left, NRMC board member Ronald Corkern, CFO Brad McCormick and municipal advisor Nnamdi Thompson. By Carolyn Roy carolyn@natchitochestimes.com Pat Ward-Hoover believes that the Parish Council should find new auditors since the current firm has done them since 1984. At the Parish Council meeting Monday, she started by saying she was concerned about the same firm conducting the audit for so long. The conversation then turned to “an older man” she believed to be a partner in the CPA firm, approaching her at a local business saying her “politics stunk” and he would work to get her defeated. “Tell him for me…let him know you came up here,” Ward-Hoover told Mark Thomas, the partner who was there to deliver the annual audit with CPA Jessica Broadway. Thomas was adamant in telling Ward-Hoover that she had the wrong Cunningham. “That’s not the one on this letterhead,” Thomas said. “Politics have nothing to do with what we do. That needs to be clear,” he told Ward-Hoover. Thomas said that his firm was the only one within 75 miles who audited government entities and choosing a firm from another city would not be supporting local business. He also said that his firm is approved by the Louisiana Legislative Auditor and subject to peer reviews by that office. The firm has audited the City of Natchitoches since 1962 and has always received approval of the Legislative Auditors. He said their audits were always completed on time. In another matter, Council member Chris Paige was critical of Parish President Rick Nowlin for wanting to hire a part-time receptionist. Nowlin said he received 40 applications for the part-time, 25 hours per week position that he says will relieve his executive assistant of spending most of his time answering the phone and delivering messages. Nowlin said the position was in place six years ago when he took office and he had eliminated it to save money. Council member Doug deGraffenried was the only one to vote against a resolution of support that is necessary for the Natchitoches Regional Medical Center to get up to $9 million for improvements in and around the hospital. Paige abstained since he works at the hospital and Rodney Bedgood, Russel Rachal and Ward-Hoover voted yes. deGraffenreid’s question to hospital CFO Brad McCormick and municipal advisor Nnamdi Thompson was, “Who owns the hospital?” He asked what the hospital’s revenue was in 2017 and a “theoretical” question, “If we sold the hospital, who gets the money?” The reply was that the Parish is not encumbered by hospital debt and is owned by the Natchitoches Parish Hospital Service District. Thompson said governing bodies commonly create districts such as those for hospitals and levee boards. The local district that built the hospital was created in the 1950s. McCormick said the hospital grossed about $60 million in 2017 and operated on a 1 percent profit margin. deGraffenreid said he was “wondering out loud” if some entities pay a percentage of the gross to sponsoring entities such as Parish Government. Attorney Ronald Corkern who sits on the hospital board, said that through the years, a number of people had wanted to sell the hospital. He said that was the worst thing that could have happened in this community. “Hospitals have been sold and sold and sold,” Corkern said. If the hospital were sold, the money would go to the service district for health care, not other matters, like roads, Corkern said. It would also take a public vote for the service district to sell the hospital. Nowlin said the hospital contributes $75,000 annually to Parish Government and it is used by the coroner’s office. Robert Morgan spoke to the Parish Council Monday in supporting a proposed half-cent sales tax. Morgan asked how the severance tax was used and could it be used for roads. Nowlin said that the severance tax was used to fund the criminal court system. The Parish received $423,950 in severance tax in 2017.